Last year we re-introduced you to Elaine Kramer of Prairie du Chien, Wisconsin, when we honored her as a “Wisconsin Treasure”. For 20 years she thrilled audiences across North America with her Six Horse Roman Riding Act. Her recent video “Dreams to Reality” continues to thrill and inspire. 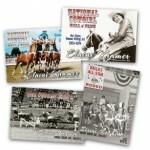 Elaine had recently been nominated for the Cowgirl Hall of Fame. Your response was overwhelming as letters of support for her induction flooded in. Elaine was thrilled herself when she received word in June of her unanimous choice for induction into the Hall of Fame. Among Elaine’s guests at the induction festivities were officials from the Wisconsin State Horse Council and Midwest Horse Fair, and almost 100 other friends and fans from across the nation. In the past year Elaine’s thrilling ride has continued as she has re-connected with old friends and made many new ones along the way. “Heartfelt thanks go out to all!” Please join the Midwest Horse Fair in welcoming the National Cowgirl Hall of Fame’s newest honoree!